Do you or someone you know love Mountain Dew? Like the kind of person who may have it pumping through their veins at any given point during the day? If so, this simple cake is a must try! 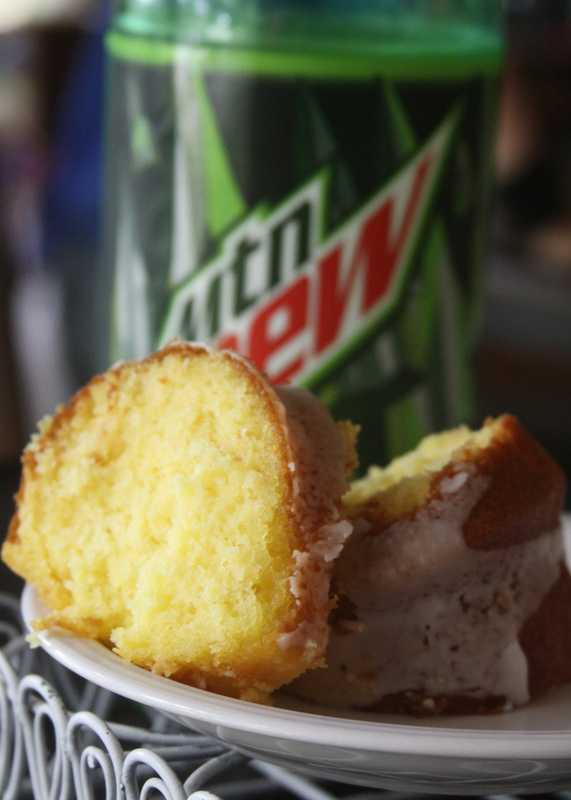 Adding a can of Dew to a boxed lemon cake mix and topping it with a glaze infused with the lemony soda makes this cake irresistible to anyone, especially a Mountain Dew connoisseur! My sweet hubby has a serious Mt. Dew obsession. I am certain a day doesn’t go by without at least two cans of Dew running through his veins. For his last birthday I was searching for a great way to make a special cake for him that was something simple, light, and a little different. He doesn’t love chocolate, or cake icing – nothing fancy or too overly sweet. 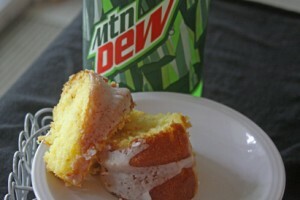 As I searched for something that he might like I came across two great recipes for Mountain Dew cake! What a fun way to make a birthday cake special – by using his very favorite drink! The cake could not have been more perfect for him. He loves anything lemon, and how could he resist it – it was made with Mountain Dew? One recipe was for Mountain Dew cupcakes that looked Delicious, but the were a little more complicated, and had butter cream frosting, which isn’t his favorite. Since I was also making a grasshopper ice cream cake I really wanted this cake to be simple to make. When I spotted a recipe on Cookies And Cups for a Mountain Dew cake that used a boxed lemon cake mix and a can of Mountain Dew – I was sold! This cake was so amazing – I loved it and so did he. 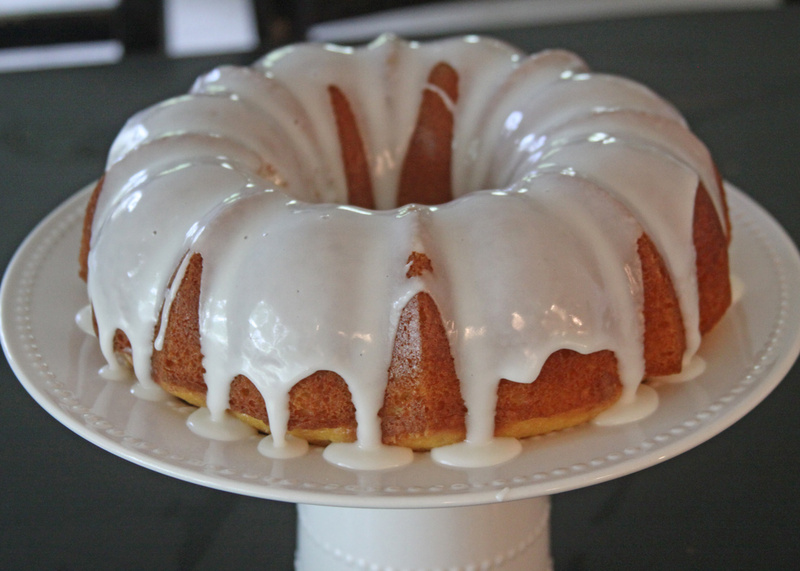 The lemon bundt cake was turned out so light and fluffy and the glaze had the perfect sweetness with a hint of Mountain Dew Flavor. For how easy it was to put together I was shocked at how tasty it was! It was a simple as throwing the cake mix, eggs, and oil into a bowl, mixing and baking! After it cooled the simple glaze drizzled perfectly over the easy lemon cake. It was pretty to look super easy! I moved it to my DIY $2.00 cake stand made from dollar store dishes and put it on the dining room table for the party. It was all I needed as a centerpiece to decorate for his birthday dinner. I have a feeling that this cake is going to become a very common request in our house! The kids loved it as much as the adults and it was so easy that I will certainly not complain if it is requested over and over. 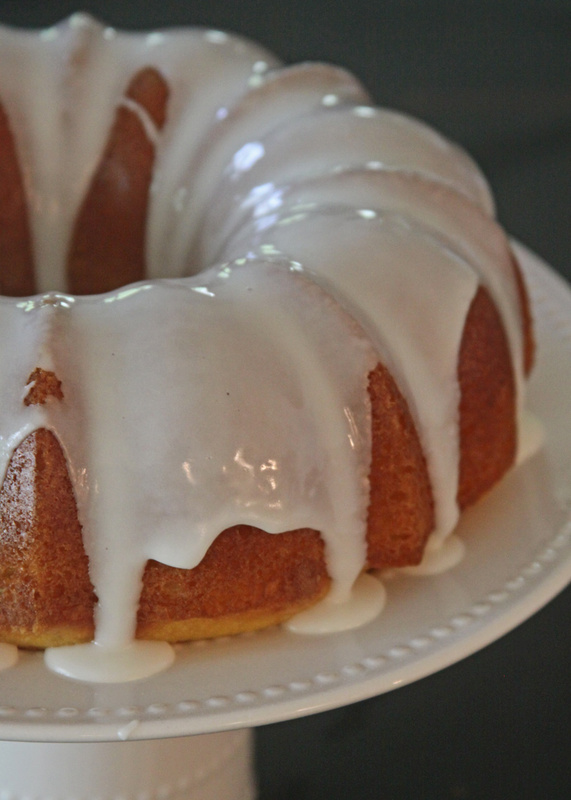 This cake has a nice light texture and lemony flavor. I wouldn’t say that it actually tastes like Mountain Dew, but you certainly get a hint of it, especially from the glaze! Certainly a great option for a perfect light summer dessert, or anytime of the year, really! 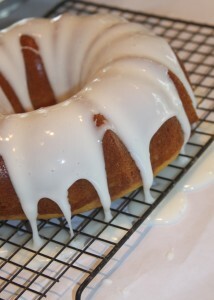 2.Spray bundt pan with cooking spray. 3.With your mixer combine the cake mix, the Mountain Dew, the eggs and the vegetable oil. Mix on low for 30 seconds and then turn speed up to medium and continue mixing for 2 minutes. 4.Pour cake batter into prepared pan and bake 45 minutes, until cake is set and toothpick comes out clean. 5.Let cool in pan for 10 minutes and then transfer to wire rack to finish cooling. 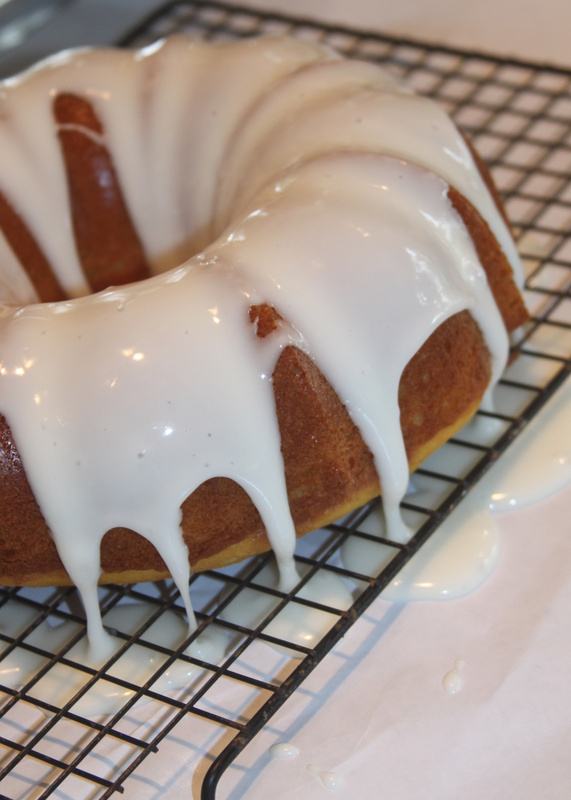 6.When cake is cooled prepare glaze. 7.Mix 3 cups powdered sugar and 1/4 cup plus 1 Tbsp Mountain Dew together in a medium bowl. 8.Stir until there are no more lumps. 9.With cake on wire cooling rack, place a piece of wax paper underneath, so when you pour the glaze over the cake you catch the excess. 10.Pour glaze on top of cake allowing to coat the sides of the cake. 11.Serve when glaze has set. Just made this tonight, so moist and delicious…. This will keep me out of the Starbucks for their lemon loaf haha.